Why does the greatest superpower appear so weak and ineffectual to allies and enemies alike? Is there a connection between America’s morals and its morale? The 20th century was undoubtedly the American century. But after seven decades serving as the world’s policeman, a day rarely passes now without another alarm sounding that the United States is in global retreat. Just two decades ago the United States was hailed as the world’s sole superpower; but with dizzying speed, several economic convulsions, the threat of terrorism, diplomatic blunders and moral degeneracy have the nation reverting to an isolationist mentality and on the verge of superpower suicide. America’s downward trend and the economic and military ascension of numerous regional powers have become obvious to all but the willfully blind. A growing chorus of political pundits repeatedly addresses the topic. “America’s Global Retreat” blares one headline from The Wall Street Journal, while the BBC asks about “The Decline of U.S. Power?” Best-selling books also paint a dismal future with titles like After America, America: Imagine a World Without Her and The Post-American World. Whether you call it morale, will or national pride, this valuable component of greatness is bound to a country’s identity and purpose. America once had a national identity centered on a Judeo-Christian culture and a concept of American exceptionalism. It was tied to a purpose of actively promoting and defending freedom. This has slowly evaporated. As America’s morals have departed from the biblical standards (including destruction of the family though adultery, out-of-wedlock births, abortion, homosexuality and illegal drug use, to name a few of the most prominent evils), its morale has also declined precipitously. The Bible has a warning for nations that persist in breaking God’s laws: “I will break the pride of your power” (Leviticus 26:19). About half of Americans feel that U.S. power is waning and that it plays “a less important and powerful role as a world leader than it did a decade ago.” Among the young, this trend is even more pronounced. A paltry 15 percent of 18- to 29-year-old Americans believe that the United States is the greatest country in the world, according to the Pew Research Center in 2014, down from an already anemic 27 percent three years earlier. Record numbers of Americans now believe that the U.S. should mind its own business internationally and want to reduce overseas military commitments. The American people “have grown ever more convinced that the United States really is in decline. … Little wonder then that much of the world today worries about American staying power” (Robert Kagan, “The Ambivalent Superpower,” Politico, Feb. 27, 2014). “We are entering an era where American dominance on the seas, in the skies and in space—not to mention cyberspace—can no longer be taken for granted,” grimly acknowledged Chuck Hagel, the previous secretary of defense, as he announced a new round of budget cuts. 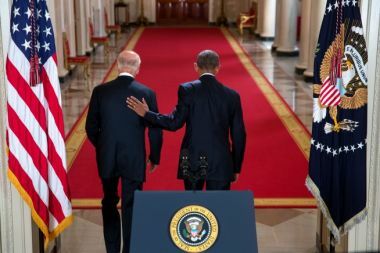 U.S. President Barack Obama walks down the Cross Hall of the White House with Vice President Joe Biden after delivering a statement on the controversial Iran nuclear agreement on July 14, 2015. Since 2012 the U.S. Army has dissolved 13 brigade combat teams—a drop of 80,000 active duty troops. The Pentagon announced 40,000 further troop cuts by 2018, shrinking the Army to 450,000, its smallest size since 1940 when Germany was conquering France. By some counts the U.S. Navy is at its smallest since World War I. While maintaining its congressionally mandated 11 aircraft carriers, only three of them—and just 35 percent of the entire Navy fleet, fewer than 100 ships—are actively deployed (Steve Cohen, “America’s Incredible Shrinking Navy,” Wall Street Journal, March 20, 2014). Plans to eliminate planes will make the U.S. Air Force the smallest and oldest since its inception in 1947. The average aircraft age is now more than 25 years old, and multiple upgrades or replacement programs have been scrapped or drastically reduced. “Since the end of the cold war,” according to The Economist, “one simple geopolitical rule has endured: do not take on America. The country’s armed forces have been so well resourced and so technologically superior that it would be utterly foolish for any state to mount a direct challenge to the superpower or its allies. This rule still holds—but it is no longer quite as compelling as it once was. 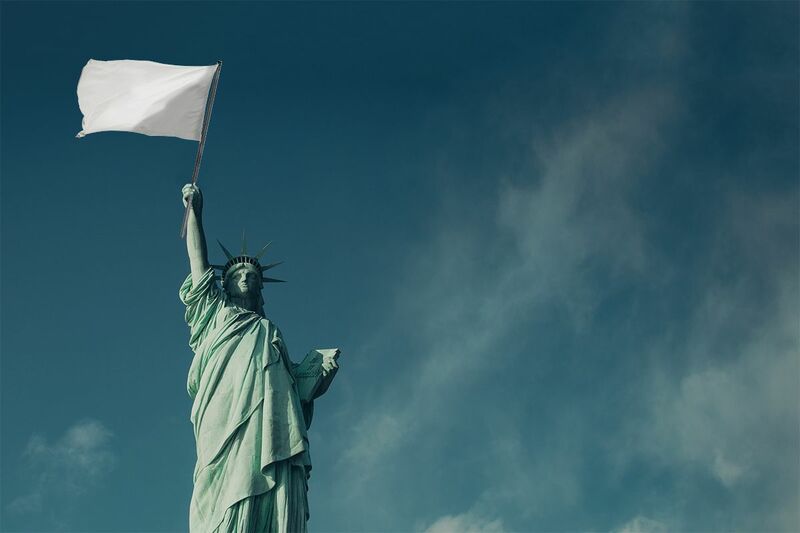 Although America still possesses by far the most capable armed forces in the world, the technological advantage that guarantees it can defeat any conceivable adversary is eroding quickly” (“Who’s Afraid of America?” June 13, 2015). Military strength provides diplomatic leverage, which complements and magnifies other components of national power. But such leverage ultimately derives from the foundation of economic vitality. Drowning in massive federal debt with deteriorating credit-agency reports and repeated debt-ceiling crises, economic growth is slowly choking and could be on a downward spiral even as government entitlement programs are set to massively increase in the next few years. Fiscal policy affects everything else, according to national security experts Elbridge Colby and Paul Lettow. “Among allies, adversaries, and swing states alike, U.S. fiscal policy is increasingly calling into question America’s ability to lead globally” (“Have We Hit Peak America?” Foreign Policy, June 3, 2014). The cratering loss in strength and will is causing enormous global repercussions. “Perceptions shape actions,” notes foreign affairs columnist Bret Stephens. “Allies who doubt the credibility of American security guarantees, of its strength of will, will pursue their interests irrespective of Washington’s wishes or commands. Enemies who think they have nothing to fear from the United States will do as they please. … American military power is becoming more of an over-the-horizon rumor than it is a visible and confident reality. For power to be believed it has to be seen” (America in Retreat, 2014, pp. 12, 220). What America—and the world—really needs is to respond to God’s call for national and individual repentance. God’s Word offers hope to those who are willing to heed the warning. Despots around the world have taken note, leading to a steady increase in probing of U.S. power and will. A Wall Street Journal editorial recognized that “China, Russia and Iran”—in addition to the rising Islamic State—“are taking advantage of American retreat to assert political and (perhaps eventually) military dominance over their corners of the globe. They share a goal of reducing U.S. influence, bending neighbors to their political will, and ultimately using that regional base of power to diminish the global sway of Western democracies, especially the U.S.” (“Rise of the Regional Hegemons,” May 26, 2015). A catch-22 phenomenon is now underway, as described by Nick Bryant in a BBC report. “The United States is no longer so keen to exert leadership in an increasingly messy world. Yet one of the reasons why the world has become so disorderly is because America is no longer so active in imposing order. Over the course of this century Washington has lost its fear factor. … World leaders nowadays seem prepared to provoke the wrath of the White House, confident that it will never rain down on them” (July 10, 2015). Emboldening rivals and disheartening friendly nations, this perceived abandonment is spurring allies to look out for themselves. Persian Gulf states are arming themselves to fend off their enemies. Policy makers in the European Union have noted with dismay the American administration’s provocative decisions to walk away from “nonbinding” alliances, compelling them to confront their own long-term security outlook in a world in which Uncle Sam has chosen to take a vacation from leadership. U.S. allies in East Asia face similar worries, as China aggressively builds militarized outposts in disputed international waters. Ravi Velloor, the foreign editor of Singapore’s Straits Times, echoed the thoughts and frustrations of many of America’s allies: “It’s one thing to have enormous power. It’s another thing to show you have the will to use it” (quoted by Robert Kagan). Is America’s decline a foregone conclusion? What America—and the world—really needs is to respond to God’s call for national and individual repentance. God’s Word offers hope to those who are willing to heed the warning. “If My people who are called by My name will humble themselves, and pray and seek My face, and turn from their wicked ways, then I will hear from heaven, and will forgive their sin and heal their land” (2 Chronicles 7:14). Will America turn from its ways before it is too late? We should pray fervently for a complete national repentance and seek individually to draw close to Him in humble repentance.